Four years ago I began searching for a red grape variety to replace the Frontenac vines in my vineyard. I had chosen Frontenac when I originally planted my vineyard along with three other varieties for trial. The reason I had decided on this University of Minnesota variety had to do with a lot of unknown variables. There was and is literally no one other than me who is growing fine wine grapes within a 50 mile radius of my house. 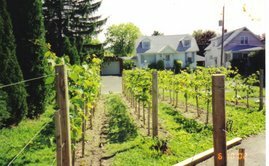 Oh there are plenty of people growing grapes and making wine, but by and large they are Italian immigrants who have planted what would "grow with little effort" in the USDA zone 5b climate of New York State's Capital Region. That is to say, vitis labrusca grape varieties like Concord, Niagara and the like. They grow well, make delicious jelly, pies and juice, but terrible wine in my opinion. So when I planned my vineyard with nothing to go on, I had to take into consideration the all-time record low temperature of -28F and the more regularly occurring low of -10F. After a lot of research, Frontenac seemed to be a good choice. It is very hardy, to -30F or better. I also read many claims of very good "Pinot Noir like" wines being produced with it. I planted it figuring that it would guarantee me a crop despite winter lows and hey, if I could produce "Pinot Noir like" wine with it, I was all set. As a grower, this is how you begin understand what that ambiguous French word "terroir" (pronounced "ter-wah") means. This word has been used to denote the special characteristics that geography has bestowed upon grapes. It can be very loosely translated as "a sense of place" which is embodied in certain qualities, and the sum of the effects that the local environment has had on the grapes which contributes to the quality and distinctiveness of the finished wine. In layman's terms: those Frontenac grapes did not like the terroir of my backyard. 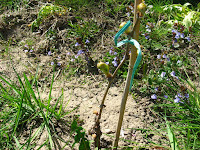 The vine was overly vigorous, prone to bunch stem necrosis (rot that killed the stems and prevented many grapes from ripening) and the wine was just plain bad. I made three vintages and it always tasted like funky, bitter grape juice with tongue-burning acidity. It was full of off-flavors and not pleasant at all. I know there are growers out there who are making pleasant wines with this grape even enjoying commercial success with it due to their terroir and wine making techniques, but not me. Thus began my quest for the perfect grape to replace it. Replacing a variety is actually exciting when you have a bit of experience under your belt. You begin to imagine a new variety ripening perfectly and the wonderful wines you will make with it. As I searched around taking into consideration my climate, site and other factors, I narrowed it down to a few varieties. One of them I stumbled across was a German red variety called Regent. The information out there is scarce but it is described as being bred in 1967 by Professor Gerhardt Alleweldt at the Geilweirlerhof Institute for Grape Breeding in Germany. It is a cross of the vitis vinifera variety Diana (Silvaner x Muller-Thurgau) with the interspecific hybrid Chambourcin. Thus it is still considered an interspecific hybrid. Since it has such a great percentage of vitis vinifera in it's parentage though, in Germany it has been declared vitis vinifera. I read that it makes deeply colored wines with good tannins and red fruit components, as well as being able to handle oak well. The wines have been described as "Southern Rhone" in character. Possibly one of it's best qualities is that it is very resistant to fungal diseases. All of this sounded great so I began to search for Regent vines and Regent wines, to no avail. No one had the vines, and the wine!? Nowhere to be found in the U.S.A. They seem to be available in the UK but not here. I also couldn't find any information on it's hardiness, which was a concern to me. 1. Regent has very controlled upright growth with low to moderate vigor. I have my vines grafted on 101-14 for my heavy soils and phylloxera resistance. It is easy to manage so far which is interesting because every other variety I grow is quite vigorous for me. 2. It is very disease resistant, I spray it every other time I spray Cab Franc and Riesling and have had NO problems with disease. 3. It ripens in early October for me, just after Marechal Foch and well before Cabernet Franc. 4. So far I have had no winter damage on it with low temps around -5F. I hill up the graft union and blow as much snow as I can on them but no other protection. 5. 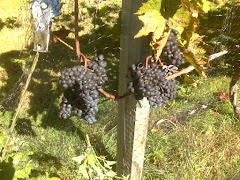 I harvested about a week before I would have liked to this year at 21 brix and 6.1 T.A. I would have liked to let the grapes hang to about 23brix but the bees were destroying my crop so I had to get them in. 6. So far the wine seems good, but I'm thinking the extra week would have been beneficial. It has excellent color, an earthy nose with spicy hints. The flavor is a bit too young to judge yet but seems pleasant. I'll keep up posting on it as it develops. So did I make the right decision? I'll know in a few more years, but that's how you find the perfect grape. There are no shortcuts. I'm pleased so far but only time will tell. I hope this information helps others who may be interested in this grape. Please feel free to ask any other questions you may have about it. I too have been trying to find Regent Grape vines. Can you share where you found yours? Thanks for stopping by! Does it get cold enough where you are in Mexico to send the vines dormant? What varieties are you growing and how will you deal with the climate? Very interesting, Best of success to you! Love the blog. I was wondering if you knew whether Foch can grow on its own roots. I've got a backyard vineyard of my own (much smaller and younger than yours though) and I'm going to try to root some cuttings from my Foch. Just wondering if I'm wasting my time. Thank you for the kind words! You can definitely grow own-rooted Foch. All of mine are. As a matter of fact half of my Foch vines were taken as cuttings from existing vines I had purchased. They are a little less vigorous on their own roots, but personally I like to limit vigor anyway. Just take some cuttings and wrap them up in newspaper, pretty thick. Then wet the newspaper and put the cuttings in a black plastic garbage bag and keep them in the fridge or a root-cellar. A week or two before your last frost put them on top of the fridge or some other warm place and wait a couple of weeks. They will start to callous and push buds. Then plant them in the ground or in pots and keep them watered. This is very important! They'll take off in about June, depending on your climate. Hi. I just found your blog tonight and its cool. Last year I plant 75 vines in my backyard. 1/2 reisling, 1/2 aroura & 25 concord. I live 30 mins east of Lake Michigan & we get tempered by "the lake effect." I hope things turn out as well for me as they did for you. It has been a learning process and I keep learning more and more. I hate the waiting. I spend lots of time in our mini-vineyard. Great blog, nice to see so many other people with the same interests. I'm in NW Indiana right near the lake and I've just planted Corot Noir, Baco Noir, Cabernet Sauvignon & Frontenac grapes and all is going well. My question for you is, what sprays do you use to keep bugs away in the summer?? I propogate grape plants, mostly hybrids. I grow Marechal Foch and Cayuga White, and they are both hardy to our climate, Zone 4. I am considering the possibilties of expanding my business to a grafted variety. We have been researching Regent. Any advice would be appreciated. Some of the leaves on my Regent Grapes are turning dark brown along their edges; some have turned completely brown/purple and do not look good. What might be the problem? I have this too on some of my Regent vines. At first I thought it was leafroll virus as it looks very much like this. But it doesn't happen to the same vines every year and leafroll virus is not curable, so I doubt that's it. I've given thought to magnesium deficiency but I have my doubts there as well since it moves around from year to year. I have heard this is common with Regent and my guess is it's how Regent reacts to a particular fungus disease. I haven't really been spraying my Regent since it is very resistant, but I am going to start trying a light spray program, maybe every other time I spray my vinifera varieties. So far it hasn't affected the grapes. Hope this helps. I am a college student and beginning grape-grower/wine-maker. Im interested in urban homesteading and indoor growing. I was wondering if you knew of anyone who has tried to grow a grape indoors. I am from chicago and have had success with tomatoes, lettuce and a host of other vegetables in my wintery dorm rooms and apartments. Any information you have about grapes growing, or winemaking pioneers would be helpful. Dave: Thanks for all the info on Regent. Very useful considering the scarcity of information about this variety. Lynn: I am quite pessimistic about indoor grape growing. They require LOTS of sunshine to properly mature the fruit. Hi Dave, i just found your blog. Very interesting reading as our situation is quite similar: cool climate, small scale backyard vineyard! About the Regent; this is one of the most popular red varieties in the Netherlands. But currently another German hybrid called Rondo is getting more popular. In our experience, Regent on its own is a bit more difficult to turn into a good wine than the Rondo. A lot depends on the yeast. But mixed with Rondo, Regent makes a very nice wine. I hope Regent turns out fine for you too. And success with your blog. I planted Regent in Northern Alabama along with Orion, another German hybrid. In the first year they grew over 10' in length. I will let them bear a small crop next year. How is your wine progressing? It's interesting to read your experiences about Regent. I bought one plant last summer from Mosel-valley, Germany. I live in northern Europe, Finland (latitud 61,20 degrees). Last night it was quite cold, -22 degrees celsius (approx. - 9F). Only what i know about Regent was what the seller said: "It's quite hard". Hopely it seems that he was right. Plant was quite small and now it is under snow-cover (30 cm). I also have Rondo and Summer Sweet hybrids from Germany and Hasansky Sladki and Zilga from Latvia. Last summer i got few grapes from Rondo and Summer sweet. But they all are just few years old. Next summer i hope that i'll get enough to make a wine. Thanks to everyone for your comments! I'm sorry I've been so busy I haven't been able to respond as I should. But I'm back on track so keep 'em coming! so far my Regent is coming along well. It has a unique taste and I'm hoping it mellows with age. I also haven't been able to let them hang as long as I would like because bees just devour them. It's a real problem that I'm searching for a solution to. It's the only variety that I have that problem with. I'll post about the wine as soon as I know more about it's development. All the best, keep me posted on your progress. so how did the regent grape grow for you? Hows the wine? PLease let me know, because i would like to grow them in western PA. And like you said before, the info on the grape is scant.. I planted 24 Regent, 24 Rondo and 6 Cabernet Cortis in 2007 in my little vinyard near Copenhagen, Denmark. In 2009 I made a nice heavy, fruity Regent-wine with tannin and a note of pepper. But in a blend with Cabernet Cortis or Rondo the Regent-wine is better. - And importent for me - it is not necessary to use spray against diseases in the Regent plants. I have 22 Regent and 50 Orion vines planted in the Waikato area of the North Island of New Zealand (not a big wine growing area due to wet summers). The vines were sourced from Germany and imported by my employer, a plant research organisation. I have made two vintages, the second just bottled. The first is interesting, certainly drinkable but unlike any other red variety. Winters here are mild, only about -5degC. I also get red coloration on some leaves. I tried foliar Mg sprays and it has helped, I think. anisation. I have made two vintages, the second just bottled. The first is interesting, certainly drinkable but unlike any other red variety. Winters here are mild, only about -5degC. I also get red coloration on some leaves. I tried foliar Mg sprays and it has helped, I think. The vinification is finished but the wine is not. To be able to age and to improve the wine must be clarified again. After that the beverage will be put in oak casks where it will stabilize.